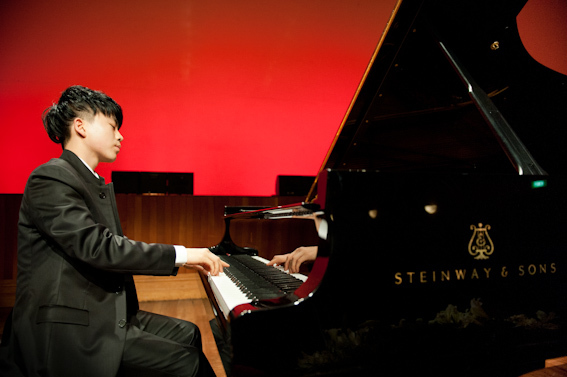 With the ink barely dry on his Royal Academy of Music Master of Arts in Piano Performance (complete with the highest distinction award DipRAM), Jason Bae is returning from London to perform a piano recital at the Auckland Town Hall Concert Chamber, Tuesday 15 September 2015 and to release his first CD. 1. "Il Lamento" 2. "La leggierezza" 3. "Un Sospiro"
Britten/Stevenson - Fantasy on "Peter Grimes"
The blood red background certainly set the scene for what was to be a fiery performance by young Jason Bae. The Lewis Eady Charitable Trust has been supporting this exciting talent since 2008 and Jason currently has a grand piano on loan from the Trust. Last Tuesday’s recital (25th September) was a culmination of that support, a huge amount of hard work on Jason’s part as well as the wonderful input from Rae de Lisle - Jason’s teacher and mentor. I can’t remember the last time I attended a ‘sold out’ solo piano performance at the Concert Chamber but it was a fitting recognition of the progress that Jason has made. The programme was a ‘tour de force’ and the sort of music you play when you are 20 and have endless energy. For me the favourite was the Rachmaninov Sonata No. 2 which I had had the pleasure of hearing Boris Giltburg perform earlier in the year for the New Zealand International Piano Festival. This is a work seldom performed, so to be able to hear it twice in such a short space of time was refreshing. I spoke to Jason before, during and after his recital and felt very proud to have been able to assist him thus far. Well done for a masterly performance and for those of you who couldn’t get tickets (I’ve been dying to say that) the concert was recorded by Radio NZ, so will be going to air at some stage. Sir James Wallace, Rae de Lisle, Christine Choi (Jason's mother) & John Eady pictured with Jason Bae. LECT presents Emerging Artist JASON BAE in his debut Auckland Town Hall Concert Chamber Recital. Jason Bae was born in Daejeon, 1991, in South Korea where he began studying piano at the age of 5. He is currently in his Bachelor of Honours in piano performance at the University of Auckland in New Zealand under the tutelage of Ms. Rae de Lisle. In 2007-2011, he has attended the prestigious Aspen Music Festival and School under the tutelage of Ms. Ann Schein. In 2008, Mr. Bae won 1st prize in the Bradshaw & Buono International Piano competition in New York, which gained him a performance at the Carnegie Hall Weill Recital Hall in May 2008. In the same year, he was awarded the New Zealand Young Performer of the Year. In 2009, he won 2nd prize at the Lev Vlassenko International Piano Competition in Brisbane, Australia, where he also received the prize for the best performance of a work by Chopin. 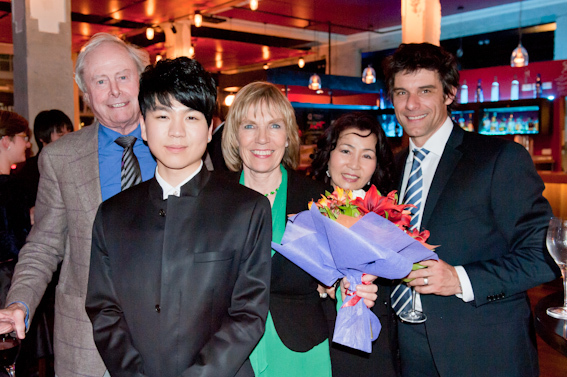 In 2010 he won the University of Auckland Gala Concerto Competition, performing Tchaikovsky Piano Concerto No. 1. Mr. Bae was soloist with the 2010 New Zealand National Youth Symphony Orchestra under the baton of Mr. Rossen Milanov, performing Stravinsky’s Concerto for Piano and Winds. He has also made concerto appearances with the Queensland Symphony Orchestra of Australia under the baton of Mr. Marco Zuccarini, Auckland Philharmonic Orchestra, Auckland Symphony Orchestra, Auckland Youth Orchestra, Christchurch Symphony Orchestra under the baton of Sir. William Southgate and Bach Musica. He has given recitals in New York City, Auckland, Wellington, Sydney, Melbourne, Brisbane and Aspen. He has performed in the master classes for Claude Frank, John O’Conor, Joan Havill, Piers Lane, John Perry, Noriko Ogawa, Christopher Hinterhuber, Marcella Crudeli, Natasha Vlassenko, Oleg Stepanov, Guillermo Gonzalez, Bryan Sayer, Michael Houston, Tamas Vesmas, Ian Munro, Judith Clark, Read Gainsford and Stephen de Pledge. We look forward to sharing our news & upcoming concerts & events with you. We are committed to keeping your email address confidential. We do not share our subscription lists with third parties. To better serve and support emerging talent and music education within New Zealand. to musicians from Primary, Intermediate, Secondary and Tertiary levels.